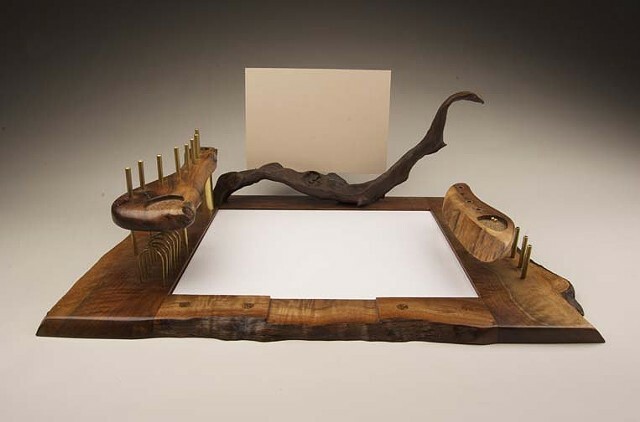 Each tabletop tying station is made from northwest hardwoods (western walnut, maple) that are chosen for their special qualities such as highly figured grain, natural “live” edge, shape and colors. The wood is locally sourced and hand picked from special stock at “Goby Woods”, a Portland Oregon environmentally green lumber company. After this thoughtful selective process, each piece is then “sculpted” in a well-equipped wood shop where it is re-sawn, joined, planed, cut and sanded to length and shape. Final assembly is done with fine joinery techniques and followed by sanding to an ultra smooth surface before applying a durable satin finish. Brass rods and tubes, carved out areas and magnets are added for the purpose of holding tying tools and materials. Each station has a place that holds a background grey card to use for reducing tying eyestrain and assisting in seeing the details and colors of your fly. There is a place on the back of this card for mounting your favorite fish or family photo for display when you are not tying.